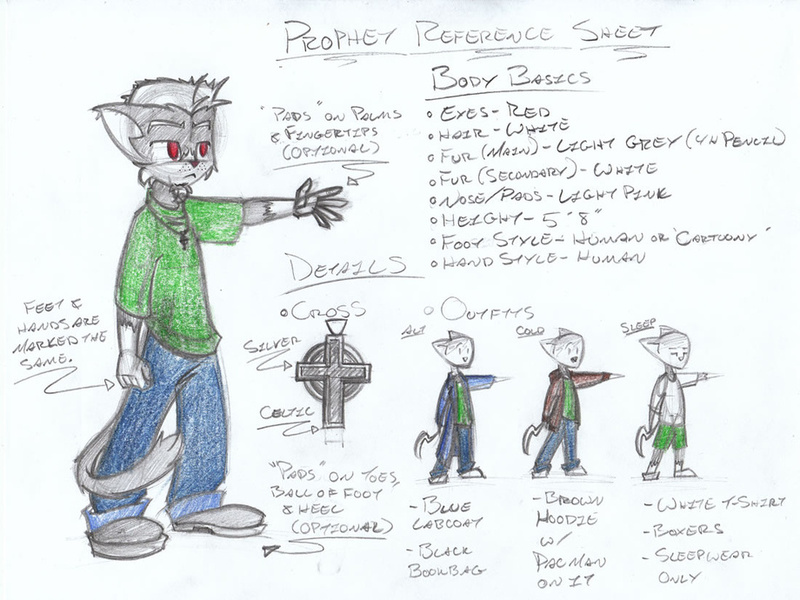 Prophet is pretty much just a graphical representation of myself that just happens to look like a grey cat person. Same height, same basic traits, same basic personality. Don't expect him to do anything I wouldn't do myself. He's Curious. Tends to keep to himself but has been known to carry on long conversations about various things. Not known to back down from an argument or fight but picks his battles wisely. Likes: Art, Science, Philosophy, History, Computers, Cartoons/comics/movies/music/games and the making of said things, Coffee, Quiet. Dislikes: Annoying people, Bossy people, Touchy-Feely types, Overly loud music. Height: About 5 foot 8 inches tall. Head: Red eyes, White flat top, Light pink nose, White fur on the muzzle/cheeks. Body: Light grey fur, White 'sock'-style markings on hands and feet, (Optional) Light pink 'pads' on the fingertips/palms of the hands, (Optional) Light pink 'pads' on toes/ball of foot/heel. Five digits on the hands and feet. Feet can be drawn in a more cartoonish style if need be. Regular Wear: Generally a t-shirt, baggy jeans and a small Celtic-styled silver cross. Prefers a pair of black boots but has been known to wear a pair of Converse-style canvas high tops. Often seen with a blue lab coat and a black backpack. Cold Weather Wear: Sports a brown zip front Pacman hoodie in place of the blue lab coat. Sleepwear: Over-sized t-shirt and boxers. Other: Sometimes sports a baseball cap. Pencils and a sketchbook. May or may not have some manner of portable gaming device or iPod Touch. I figured that, after all these years of having this character, I should draw up something akin to a reference sheet or a style thing that folks can refer to (if I ever actually commission folks). I made this as basic as basic can be because, really, Proph is as basic as basic can be at the moment. He's pretty much just a graphical representation of myself that just happens to look like a grey cat person. If you have any questions that I should address, feel free to leave them in the comments and I'll do my damnedest to answer them.